What would it mean if we saw every person as human? Let all guests who arrive be received like Christ, for He is going to say, “I came as a guest, and you received Me” (Matt. 25:35). And to all let due honor be shown, especially to the domestics of the faith and to pilgrims. It’s a tall order, to see Christ in everyone. These days I wonder if we might start with a simpler step, to see everyone as human. If so, I would have to start with Donald Trump, who was the muse of this particular post. 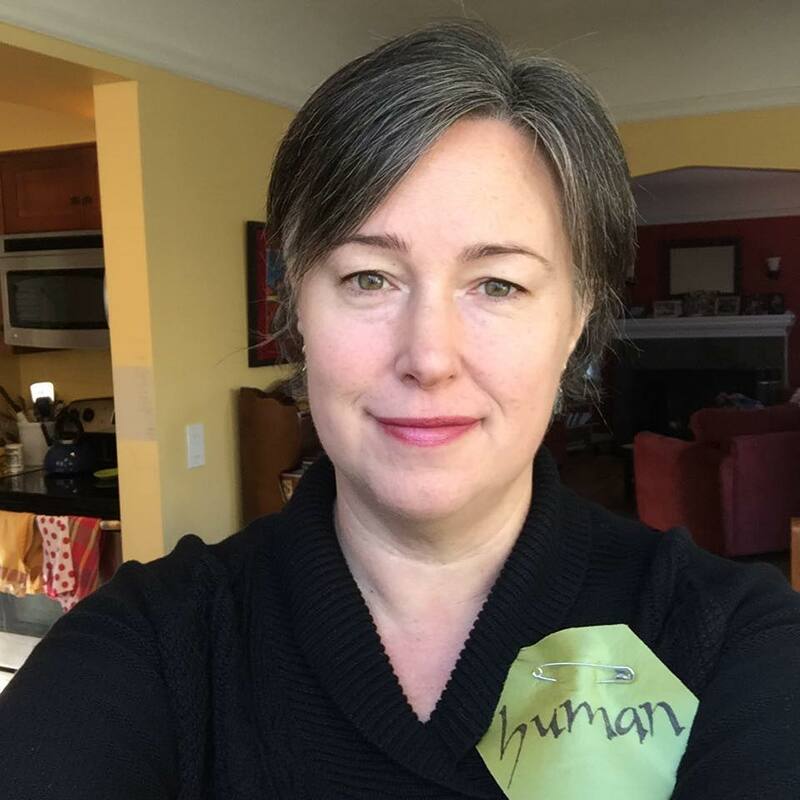 My brilliant and brilliantly talented artist friend made these “human” badges, and posted a selfie wearing the badge. I thought that was a fantastic and subversive response to Mr. Trump’s proposal that all Muslims in the U.S. wear badges identifying them by their religion. Except that he didn’t actually say that. He has proposed other fear-inducing and xenophobic things, but he did not say he thought Muslims should wear badges. I was a little disappointed because I rejoice just a little bit every time Mr. Trump reveals his cards, because, in part, I don’t think of Mr. Trump as a real-live human being, but as more of a caricature of some would-be Gordon Gekko Maverick guy with bad hair and a few ex-wives. It doesn’t help that Mr. Trump claims to be one of ours, a Presbyterian. That does not help one bit. What would it mean for me to see him as human? What would it mean for him to see a Muslim-American as human? There are the basics: inhabitant of planet Earth; homo sapiens; bi-ped mammal. But beyond the flesh and blood, inside those brain chemicals and our hearts and the experiences that form us, what does it mean to share the identity of human? Perhaps compassion is part of it – at least I hope it is. Maybe the urge to protect the young and vulnerable is a part, too. To be human is to engage in something – in a person, in beauty, in the natural world, in the life of the mind. I wish that being human meant being someone who dances or someone who sings, or someone who stacks rocks into beautiful piles just to see if they will balance. In the best of all possible worlds, being human would mean risking one’s own well-being for the well-being of a stranger. Which makes it hard for me to see Mr. Trump as human. I get how difficult this can be. But if I can’t start with someone of my own tribe – white, Presbyterian, American – is there hope for us to see the stranger as human? Or maybe that’s easier, because we don’t know or assume as much about that person who lives on the other side of this planet. I was talking with a friend who loved someone who had schizophrenia, who had a life of suffering, who was often treated as less than human. My friend said that someday we would have to talk about God and suffering, and I think that’s tied to being human, too. Is to be human to suffer? And to rejoice? Can one human have all of that in life? 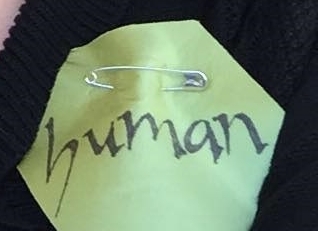 We love to assign labels and when we get carried away, we make labels for people to wear. Scarlet letters, stars of David, pink triangles. That’s how we know who the other is, who the enemy is, who the criminal is. That’s how we know we’re losing touch with our own humanity, when we segregate. Homeless. Addict. Whore. Lunatic. Thief. Liar. Idiot. Waste. Funny how no one took Jesus up on the offer to cast the first stone. Maybe the reason Benedict encouraged his monks to see Christ in all they met was because Christ first saw humans in everyone he met – people who danced and sang, who protected, who risked, who stacked rocks. And so we start where He started, seeing the humanity in all. Even Mr. Trump. Bless his heart. I can’t imagine being part of a church that ignored the sadness of the world but I wonder sometimes how much I ignore the joy of the world. “God is good/all the time/all the time/God is good” chafes me a little, because I think of how it might sound to someone who just received a terrible diagnosis or who lost a beloved. In an ultimate sense, God is good. It’s what we hang our hats on, that something Good awaits us after all the bad. But we don’t live in the then, we live in the now, and the now can be pretty bleak. Off the top of my head, I can instantly name five people whose lives are in shambles for one reason or another. I could be sad all the time. For many years I have loved Walter Wangerin’s story Ragman, in which Jesus takes what is broken in others and replaces it with what is whole in him. Near the end of the story, he is all broken, and then he dies, and then he comes back, with only a scar to show for his suffering. It is such a story. These days I picture Jesus picking up the pieces of our lives, the shreds that are still left, with care and tenderness and with the skill of an artist, putting them back together; sort of. I imagine if he tried to put us back together as we had been we would all look like Frankenstein’s monster, everything where it should be but wrong. So instead I imagine he takes us in our brokenness and makes a mosaic out of the shattered parts of our lives. Or I think about this world of ours that is torn to shreds by so much, by hunger and war, by famine, by drought and tsunamis, by greed, by fear, by apathy, ignorance. They are wood chippers, electric carvers gone mad, these forces. It’s like the map of the world has been put through the paper shredder, and Jesus stands there with the strips of what’s left and we hand him some old, yellowing Scotch tape, and beg him to fix it. “Las Monarcas” My friend Jill Ross created this mosaic of monach butterflies, and I am grateful to her for the many ways she brings beauty to the world. This image is copyrighted and used by permission of the artist. Then I think what would happen if he, being Jesus, didn’t take us up on our old tape but instead took all those strands of the shredded paper, the refuse of the world map, and wove them into something new, so that the boundaries went away, and age old enemies were woven next to each other, and what we had was no longer a map but something different, and new, and because it is woven, something stronger than what existed before. Maybe the Prince of Peace will be the Prince of Pieces, our pieces, the flotsam and jetsam of our tragedy and sin, picked up and not discarded but reused, remade, into something different but still beautiful. There is sadness in that, too; but maybe a little beauty or at least a little hope. Halloween is done, thank God. I am so over that holiday. This year we carved exactly one pumpkin, and I let the real spiders decorate inside and out. Actually, Halloween was over for me after fifth grade. That year, near Houston where I grew up, a father was found guilty of killing his son by lacing his Pixie Stix with cyanide. The next year I broke my foot, and that was that. Maybe part of the reason I’m glad Halloween is over is because I really, really, really love All Saints Day. It’s right up there with Christmas and Easter for me, only better, because there are fewer expectations. This is a terrible thing to do to people. The choir was singing “Entreat Me Not to Leave You” by Dan Forrest. (You can listen to a different choir sing it here.) I was thinking about all the people I have loved who have left me in death, and I did not have the literal opportunity to tell them not to go, not to die, not to succumb to the cancer or the internal injuries or old age. I got so sad, and had to do that pastor thing of disengaging emotionally so I could stand up and do the next thing. Celebrating All Saints is a terrible beauty. Terrible in that all that pain and grief and rage is unleashed again. Terrible that it’s done publicly. Terrible that we don’t all stand up and stomp around and insist that God stop all the tragic deaths. But then it’s so God-damned beautiful too. The golden shining of those souls. The memories. Naming the names. Affirming the hope that they are not gone forever. Not being alone in our grief. Really beautiful music. Holy communion. The best analogy I can find is wiggling a loose tooth. It hurts, but it’s a good hurt. Today I think All Saints is that way, the worship service at any rate. It hurts, remembering those people who have gone from us. But it’s a good hurt, because we had them for a while, and now we have each other, and that will do. 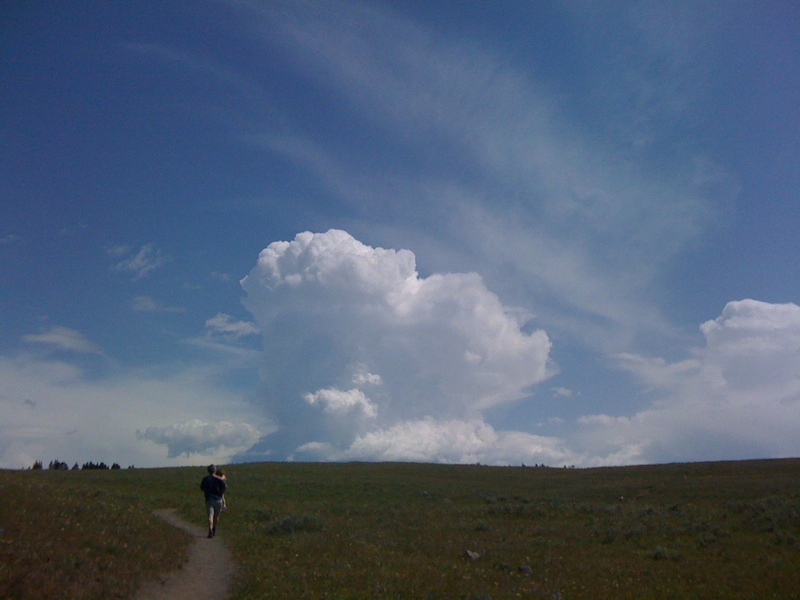 My husband and daughter, years ago, at Yellowstone, walking toward a wide sky.